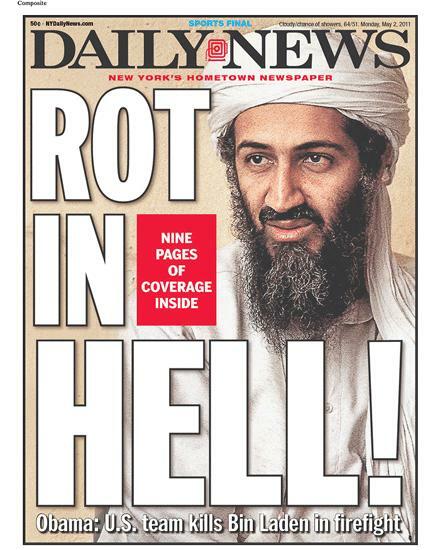 Burn and Rot in Hell: Should Osama Bin Laden Burn and Rot in Hell! Should Osama Bin Laden Burn and Rot in Hell! We are so glad Osama Bin Laden is finally dead. It has been almost ten years since he killed three thousand people in downtown New York City. One of the people almost killed that horrific day is the mother of the member of the Burn Team who is writing this blog.
" This is how my day went on September 11, 2001. While I was vacuuming the bedroom in my house, my mother called me from her desk at Merrill Lynch in the Wintergarden North Tower building of the World Trade Center. I normally can’t hear the phone over the vacuum, but this time I did. She said that a plane just hit one of the towers of the Trade Center, and that she and her coworkers had watched it hit out of the office window. She asked me if I thought she should leave work and come home. I told her yes, of course. I thought she had learned this lesson in the 1993 bombing of the Trade Center, that you need to get out fast when something like that happens. Then she said that Merrill Lynch didn’t officially tell them they could go, and that she could lose a day’s pay or a personal day if she just left. I told her to get out anyway. About ten minutes later, she called me from the lobby. She said she was so nervous about the plane, that she forgot her purse upstairs on the 30th floor where she worked. She wanted to go back to get it. I told her to forget the purse, get out of the building. Then I didn’t hear from her again. A few minutes later, the first tower of the Trade Center collapsed. Then the second tower collapsed. I could not reach my mother. My dad had called me from midtown Manhattan. “Have you heard from your mother?” he asked me. “Not since right before the Towers fell,” I told him. Hours passed. I was hysterical crying on my bathroom floor. My neighbor heard me crying from outside the window and she rang the bell. She hugged me but she could not calm me down. The phone rang at about 1:30 in the afternoon. It was my mother. She was yelling into the phone. She had seen severed limbs lining the streets, and she was covered with ash. But she was ok. She was going to walk over the 59th Street bridge and make her way home. Yes, she had gone back for her purse. She made it out of the building a few minutes before the first Tower fell. I was so grateful. I walked my dog. I turned the corner, and my neighbor was in front of her house crying on the lawn. She thought her husband was dead. She had three small children. She soon found out she was right, he had been killed. It was now just the kids, and her. No more daddy. They would never find his body, and they never got to say goodbye. I have mixed feelings today, happiness and worry. I am thrilled someone so evil is no longer on the planet. I hope people who experienced loss on September 11, 2001 feel a little bit better, somewhat vindicated, like justice was served. I also hope Americans are safe. I hope there is nothing left to fear. But as much as I want that, I know it is unlikely". So for now, we will have to settle for the fact that Osama Bin Laden surely will Burn and rot in hell. And we will have to see what the future holds for all of us. What do you think the future will hold in terms of security? And, do you think Osama Bin Laden should burn and rot in hell? What is your 9-11 story? Click comment, and let us know.